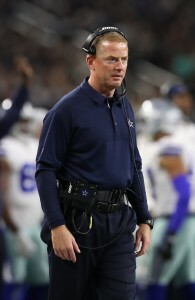 The Cowboys haven’t pondered an extension for head coach Jason Garrett, owner Jerry Jones says (Twitter link via Jon Machota of the Dallas Morning News). Jones’ comments caused a stir, particularly with speculation about Garrett’s job security, but it’s not necessarily huge news since Garrett is already signed through the 2019 season. Frankly, it would be shocking if the 3-3 Cowboys approached Garrett about a new contract with 26 regular season games to go on his deal. Garrett has had some successful campaigns in Dallas, but the Cowboys missed the playoffs last season and have just one playoff victory in his past seven full years at the helm. After a disappointing overtime loss to the Texans, the Cowboys bounced back on Sunday with a 40-7 blowout of the Jaguars. With a win over the Redskins in D.C. this weekend, the Cowboys can move past the .500 mark for the first time in 2018. And, if the Cowboys continue to win, Garrett could have an extension offer early next year. It’s time for Jerry to get a new puppet. Garrett can’t win a road game to save his life and 1 playoff win in 7 years is a joke. Unfortunately no established NFL coach is going to want to deal with Jerry so he may have to go the college route to get someone who will put up,with Jerry to get his foot in the NFL door. Garret actually has a better record on the road than at home.. he’s one of the few coaches in history who can say that.. but yea, he’s terrible. The cowboys need a fresh voice regardless of how the rest of this season plays out..
I’ll start clapping when Garrett is Gone! Jerry Jones is just crazy enough to recruit coaches from the broadcasting booth like the Raiders have done. Tony Romo to the rescue…lol.